Hi everyone, thank you so much for stopping by. I hope you are all having a great day. Today's card was made by request for my Mother-in-law, who has been a wonderful source of encouragement in my card making journey. Her support and that of my friends and family is something that I can't express enough gratitude for. For the flower, I took a couple colours of distress markers and coloured directly on the stamp, then I stamped it down, shifted the image and stamped it again. I sponged the background using a very light hand with antique linen. The greeting was gold embossed and die cut then raised up with foam tape. I added 1/4" satin ribbon and 6mm orchid sequins as accents. The matte is a deep purple to complement the other shades within the card. 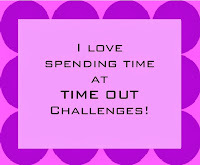 This card is for the Time Out Challenge #47. I only recently stumbled across this challenge while looking at some of the beautiful cards posted in an MFT challenge. The artists behind these cards are so incredibly talented and I feel so honoured to have my cards featured next to theirs. Thank you again for stopping by, I hope you all have a wonderfully crafty day.